ARTBA’s 3rd Annual National Bridge Conditions report continues to generate a great deal of media attention at both national and local levels. 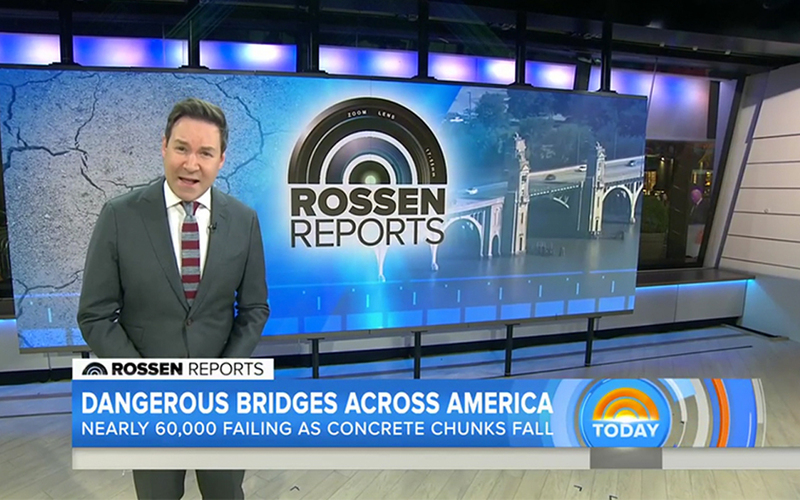 NBC’s TODAY Show highlighted ARTBA data for a March 21 story that included the number of structurally deficient bridges, and used the information from the ARTBA news release that at the current pace of bridge investment it would take at least 21 years before they were all replaced or upgraded. The broadcast spurred additional interest in the report, including a television story in Dayton, Ohio, featuring ARTBA Transportation Officials Division President Paul Gruner, who is the Montgomery County engineer. Watch what Gruner said to WDTN News. ARTBA Chief Economist Alison Premo Black also appeared via phone for a story on NBC’s San Francisco Bay Area affiliate. She also taped an interview March 24 with the FOX affiliate in Denver. The ARTBA bridge report caused a media blitz when it was released in late February, with coverage in USA Today and The Washington Post, and more than 100 other media outlets. TODAY shared its story on its social media pages with more than 3.4 million followers, driving traffic to ARTBA’s website. Viewers can find out where their state ranks and whether or not bridges they cross every day are on the structurally deficient list. While bridges on the list may not be imminently unsafe, the purpose of the annual report is to help educate the public and policymakers that they have structural deficiencies that need repair. TODAY also reported from underneath the Arlington Memorial Bridge, one of the iconic structures on the ARTBA list, sharing footage of the corrosion of steel and deterioration of concrete of the bridge listed as one of the most traveled structurally deficient structures in the D.C. area. It has become a symbol of neglect in infrastructure investment, with the National Park Service stating earlier this month that the iconic bridge needs to be completely rebuilt at a cost of $250 million or it could close to vehicle traffic within five years. View the full TODAY Show story.